Ibiza – we’ve all heard of it. The clubbers heaven in the Spanish Balearic Islands. 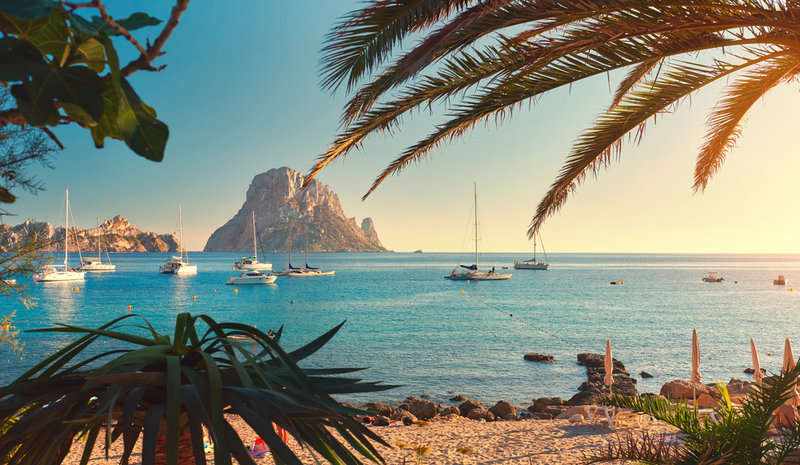 Situated in the Mediterranean Sea off the eastern coast of Spain, Ibiza has became well known for its association with nightlife, electronic dance music and wild club scene. Large numbers of tourists flock to the island every summer to enjoy the mesmerizing music, flashy beach parties and hot temperatures. A perfect way to spend the day (and cure a hangover) is cliff jumping! It might sound scary, but once you see the beautiful views at Cala Tarida, you’ll be tempted to jump right in the bright blue, Mediterranean water. A twenty minute drive from San Antonio, the white sand beach has plenty of cliffs to choose from, ideal for cliff jumping. The rock formations are of various heights, and some are quite small, so it’s great for first-timers. Don’t forget to take plenty of videos or pack the GoPro, so you can tell everyone at home about how brave you were! The waters are also ideal for snorkelling or scuba diving. For clear water, lots of marine life and coves, visit Cala Conta, Cala Salada or Aguas Blancas. If you don’t want to explore alone, speak to the team at Hidden Ibiza Tours, rated number one on Tripadvisor for Ibiza tours. Calm your mind and body with yoga on the beach. Relax into a downward dog while the morning sun comes up and take in all the breathtaking views. Most yoga classes are taught in English as well as Spanish, so there is no need to worry about the language barrier. Many morning yoga sessions are also followed by a breakfast buffet included in the price, delicious! Hippy Markets are another hidden gem of Ibiza. Since the early 1970’s, the Hippy Market just outside of the Es Cana town has been a favourite with locals and visitors. The hillside stalls are full of tie-dyed shirts and trousers, as well as pipes and bongs. Other goods are also available such as handbags, accessories, jackets, belts, shoes and leather items. The live music and street food just adds to the colorful and lively atmosphere. Food is another often overlooked part of Ibiza. From traditional Spanish paellas, to tasty tapas, you will never go hungry on the island. Restaurants are open late, with many locals not arriving until after 10pm, especially in summer. You may have heard about bread and aioli being a stable in Ibiza, as it is served at the start of most meals in all traditional restaurants. For those of you with more of a sweet tooth, Greixonera, Flaó and Ensaimadas are all great traditional Spanish desserts. These are as delicious as the candy and treats themed Sweetie Land Slot, on RoseSlots.com. This slot appeals to those who have a high tolerance for all things sweet and it takes a lot of resistance to avoid the temptation of eating the tasty candies off your device (if this was possible!). The old part of Ibiza City, and Dalt Vila will appeal to all those who love history. The Roman ruins of Ibiza Castle and the famous city walls, classified as a National Monument supply a spectacular view, especially when the walks are lit up at night. The famous site of Festival Club is another great destination for history lovers and clubbers alike. The venue closed in 1974, two years after being in operation, with a major causing factor being the 1973 fuel crisis – hiking up airfares and resulting in a huge decline in tourists from foreign countries. The architecture included an amphitheatre which hosted performance art, mock bull fights, a huge music venue as well as a variety of bars and a restaurant. The ruins of this can still be seen today. If you don’t do anything else, you must watch the beautiful Ibiza sunset. No matter what time of the year, the sunset in Ibiza is not one to be missed. Every night is unique, whether it is the colours, sounds around you or scenery, each sunset is stunning. The best and most popular place to watch the sunset is the Sunset Strip in San Antonio. With bars such as Cafe del Mar, Cafe Mambo, Mint Lounge and Savannah, it is the perfect location to listen to some great music with a cocktail in hand – the food is fabulous too. You can also bring a picnic and sit on the beach and enjoy the view just as much. With waves lapping at the side, on a boat in the open sea is also a great place to watch the sunset. You and your sailing pals will love being away from the noise and see a clear view of the sun setting on the island. However the best, and a personal favourite location, is overlooking Es Vedra on Cala d’Hort or higher ground beside the Pirate Tower. Some off road driving and a lot of uphill turns are involved to get here – but once you are there you won’t regret the journey. The breathtaking views of the sunset from here will make you truly fall in love with the island. Ibiza Spotlight provides some more great suggestions on scenic sunset spots. Many tourists fall in love with the island simply by the clubbing and music scene, however we know there is so much more to it than this. Now you know where to find it, we hope you come home with great memories and not too bad a hangover!